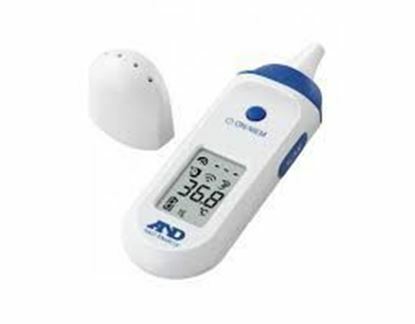 Information about A&D Multi-Function Infrared Thermometer AND Multi-Function Infrared Thermometer: Measurement range 32 to 43-degree centigrade. Beautiful and compact design. Easy to use, fast and accurate, is useful for the family. It is a good household and medical thermometer. Salient features of AND Multi-Function Infrared Thermometer: Four measurement modes. (Ear, Forehead, Surface, and Room). Fever alarm with beeper (above 37.5℃ / 99.5"). Last reading recall/memory for 25 measurements. LCD display and easy operation. Suitable for both infants and adults. Easy cleaning, just wipes clean, no need for probe covers.